Traditional Czech Christmas “kuba” the macro way – for your next holiday! Yes yes, I know, Christmas is already far behind us and we´re all looking forward to spring coming. But sadly it takes me usually a long time to catch up on all the posts I want to write, so usually I´m writing about foods that I cooked about a month ago or even a bit longer ago… :-p My bad, but anyway, you can already make plans for the next Christmas holiday, it will be here sooner than you think! I cooked pearley barley (polished barley) for half an hour. It was already presoaked, so maybe it would take a bit longer to cook without soaking. Nevertheless, the barley should still have a bite and not be too mushy or creamy! Meanwhile I sauteed a good amount of minced onion on oil with a pinch of salt and then sauteed it together with sliced soaked shiitake mushrooms, until the mushrooms got soft and well…nicely fried 😀 I seasoned them with some dried marjoram, caraway seeds, minced garlic (an essential kuba ingredient so don´t e shy! ), black pepper and an extra sprinkle of sea salt. 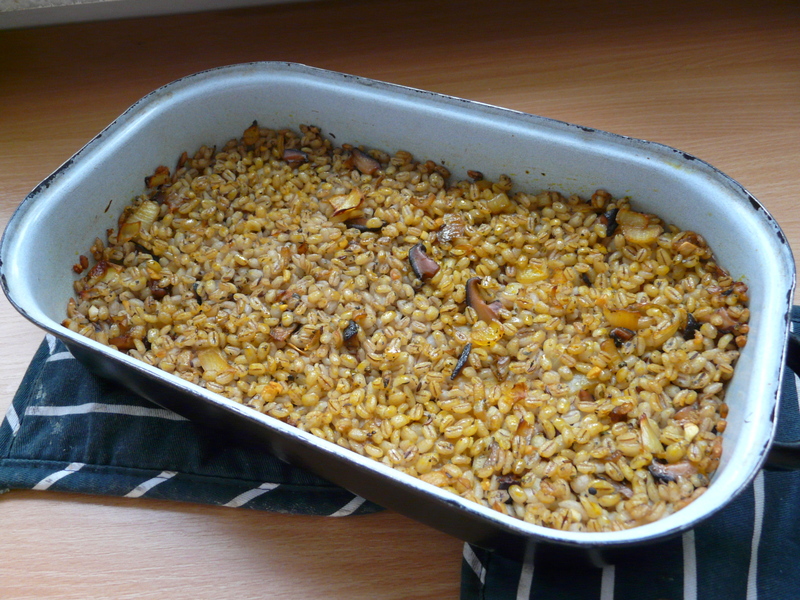 The flavour should not be too mild as you are making a casserole dish, not a separate vegetable dish with grain. When the mushrooms and onions are done, mix them through the cooked barley, transfer mixture to a greased casserole dish, smoothe the surface out, drizzle with some extra oil and bake until the top is browned and a bit crispy. The dish is nice served with sauerkraut or other pickles. Thanks Barbara! I am not sure what butka is though…? this looks super great! I am totally the same way….posting recipes from months ago in my case, lol 🙂 Better late than never! You always make such yummy & comforting looking food. It still feels like winter here, so I hope to give this a go while the weathers still chilly. Yeah, the bad thing is the posts often don´t reflect my current eating anymore, hehe 😀 Since January I´m on the glutenfree wagon again, so no barley for me 😦 But it was nice, the meal!! Here it´s feeling like spring though the mornings are still below zero. But finally there´s sun, yay!! My family heritage is Czech and my mother made boutkas for Christmas. Would it be possible to translate recipe into healthy ingredients? Great blog, thank you for all the inspiration. I am Czech myself. Kuba is great made from millet too, if you still want to enjoy it when on gluten-free diet. In fact I prefer millet to barley. Prepare a bread starter from a mixture of wheat and rye flour. Feed twice, two hours apart. Do not add salt or seeds. Then prepare a bread dough from whole wheat flour, lukewarm water, the starter and a few grains of salt. Leave it to rise for 4h in a warm place. Prepare fillings: 1) poppy: soak raisins in rice milk for an hour. Warm this up, add ground poppy seeds, rice syrup. Thicken with instant corn porridge, allow to cool. 2) tofu filling: soak raisins in water for an hour, then drain. Add finely grated tofu, sweeten with rice syrup. Don not heat this up. Fill the buchty, line up in a banking tray and bake.